Northbound US 81 traffic came in from the left on Beaupre Street, then turned and continued ahead. Behind the camera is the Red River of the North, as well as the location of an historic bridge. Originally US 59 traffic came in from Minnesota, crossed the river behind the camera, and reached this intersection. It is possible that US 59 ended here, where it junctioned with US 81. 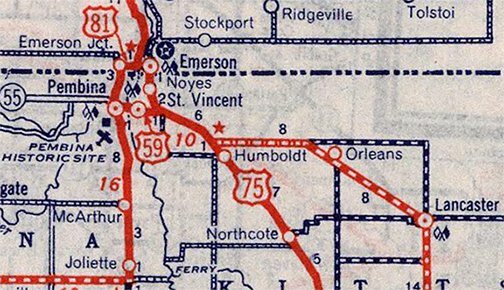 But it seems more likely that US 59 would have continued ahead, co-signed with US 81. The bridge visible in the background spans the Pembina River. The third block past that is 3rd Street -- US 81 traffic was directed right (north) there, and continued another three miles or so to the original Pembina border crossing. The border is not far ahead - that is where US 81 originally ended (and most likely US 59 as well). 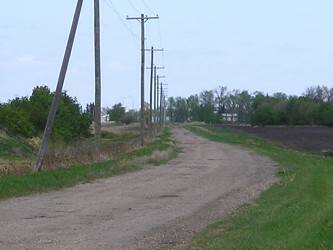 It was probably during the mid-1950s when US 59 traffic was redirected along its current route north of Lancaster MN. 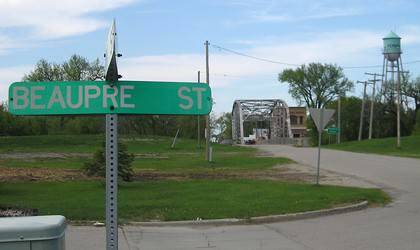 US 81 still ends at the Port of Pembina, but that is now located a bit west of the original crossing pictured above. last updated Mar. 25, 2016.